After a week at work my staycation feels like a distant memory already. That week of utter selfishness when I got up when I felt like it and did what I wanted to do with absolutely no regard for time, it was blissful and of course filled with crafty meet ups with friends. 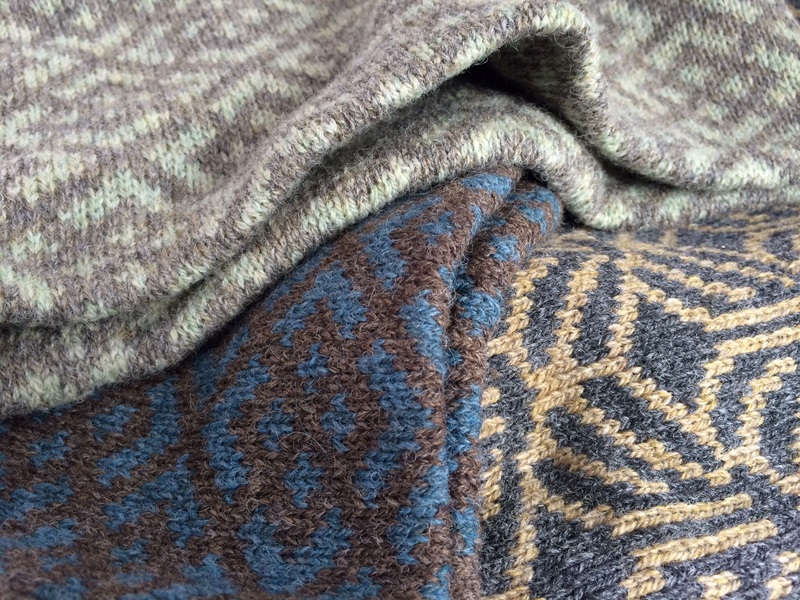 One of those friends is a person I have admired for a long time, we share a love of tweedy rustic wool in natural or muted colour her knitting always makes me swoon with deep, deep, coveting admiration. On Ravelry she is known as Julesmoon and her blog is always filled with crafty inspiration and beautiful botanical photographs. 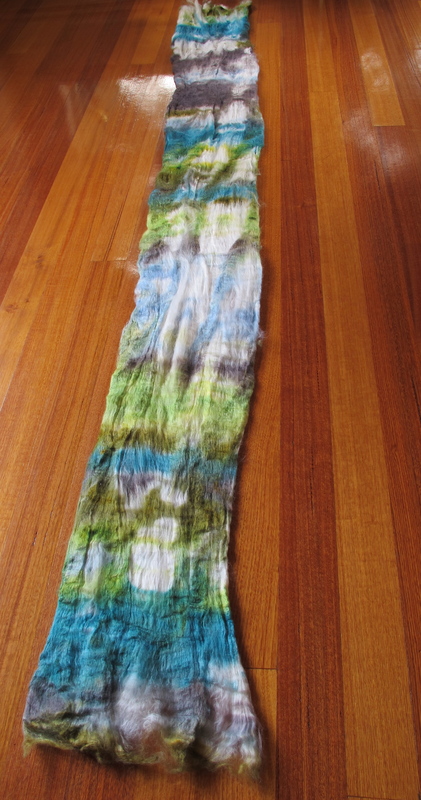 We got together so she could introduce me to natural dyeing which is something that has intrigued me for a while but I thought it too complicated. It turns out it’s not really that complicated after all, well Jules certainly made it look easy. first we dyed with real logwood chips and then with a logwood extract. Here’s a few photo’s of my samples. 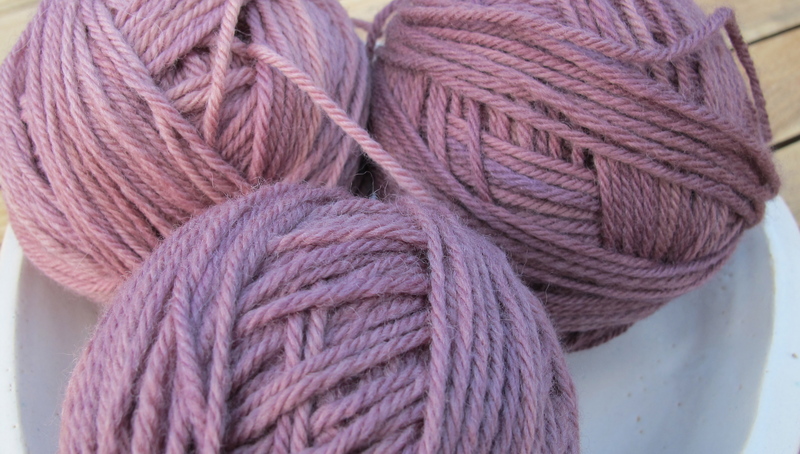 Yep, I still have my nostepinne obsession, hand wound yarn balls look cuter to me. Anyway so the darker of the three balls was done with the logwood chips and the other two were done with the extract the darker one had longer cooking than the lighter one. 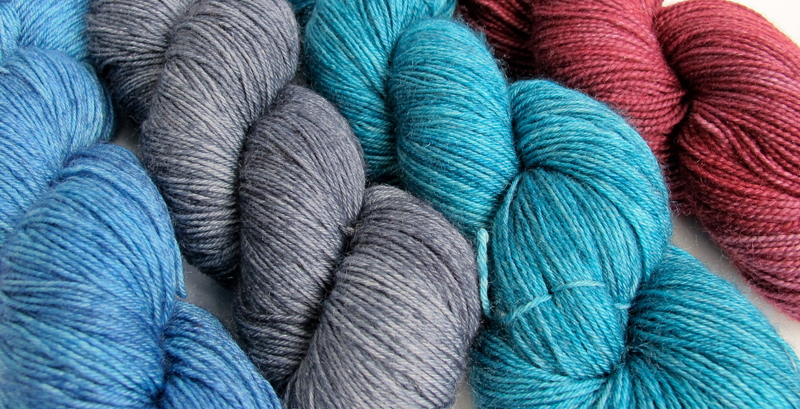 The three balls are merino and the two mini-skeins are merino/silk. 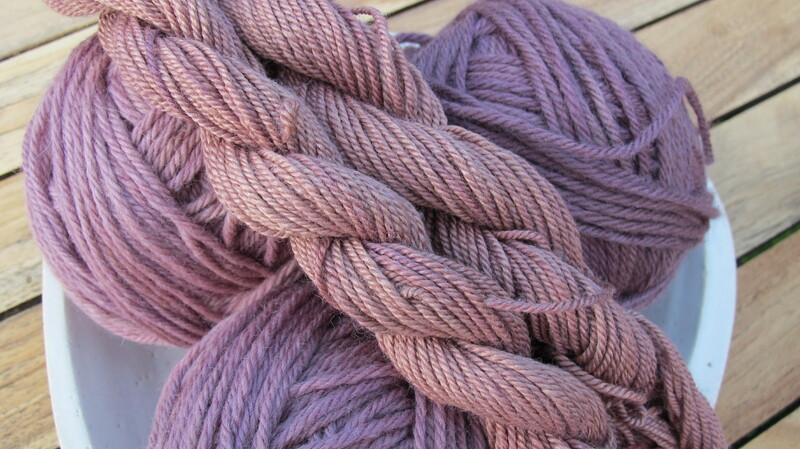 One of the merino/silk mini-skeins was dyed with the logwood chips and the other with the extract but to my eye they’re indistinguishable from each other. 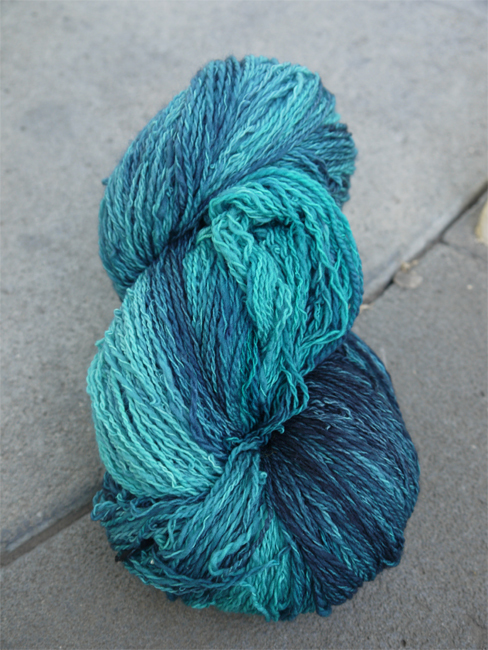 The colours are incredibly beautiful to me, soft and I actually think more natural looking than the acid dyes I’ve used before. Does that make sense? I keep looking at them to see if I’m imagining it. I don’t think I am, there is something about their hue and tone that definitely looks more natural than when I dyed with acid dyes. I love how they are subtly different. So thanks to Jules for my introduction, I hope we have many more crafty get togethers. Also thanks for the amazing lunch, I am still reminiscing about it. 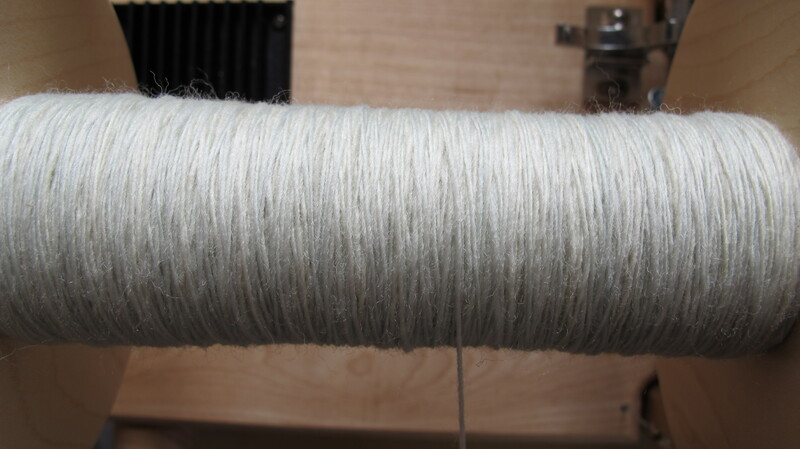 I just thought I’d update on the spinning front. 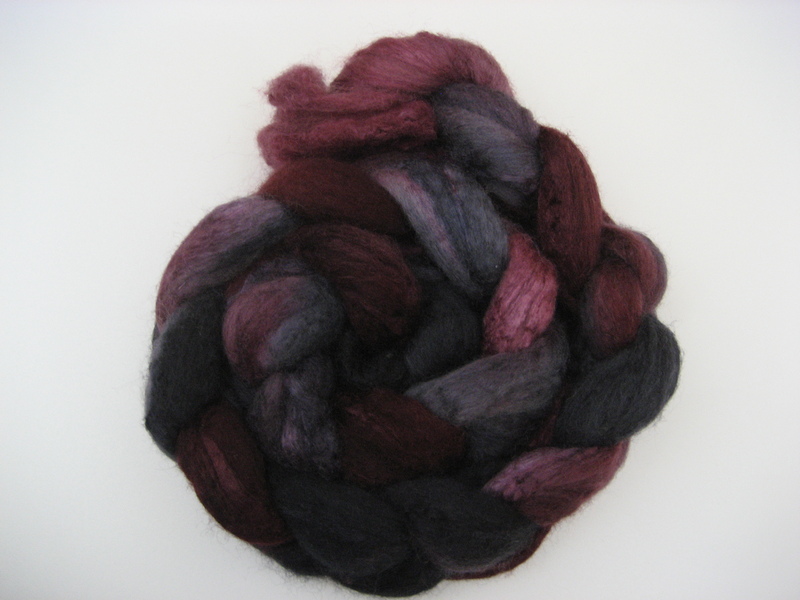 I’m still spinning the Skein Merino/silk and trying to spin it really fine which I struggle with. Or more to the point I struggle to spin fine without overspinning. I’ve been playing slow music when I spin in an attempt to slow my treading down and I think it’s working. 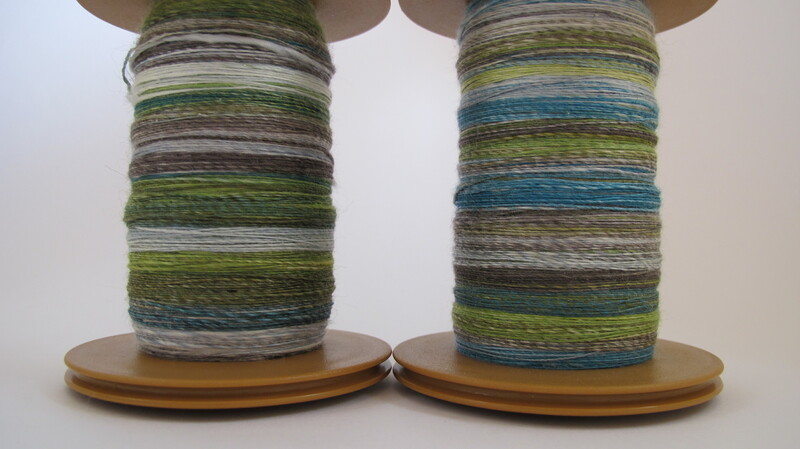 I now have 2 bobbins of 100g and I’m very happy with them. So I got out the third top and I started unravelling it width-ways, just because. 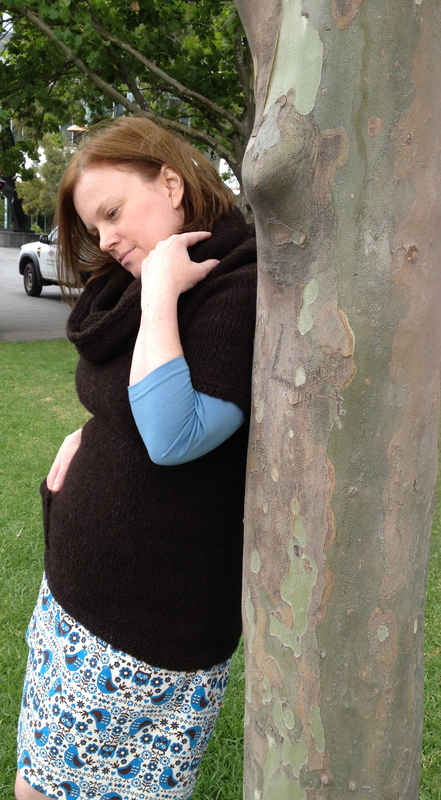 I liked the unravelled top so much I took photos. I had to lay it out on the floor because it’s so long (260cm) which meant I had to clean the floor first, but the extra mopping was well worth it I think. 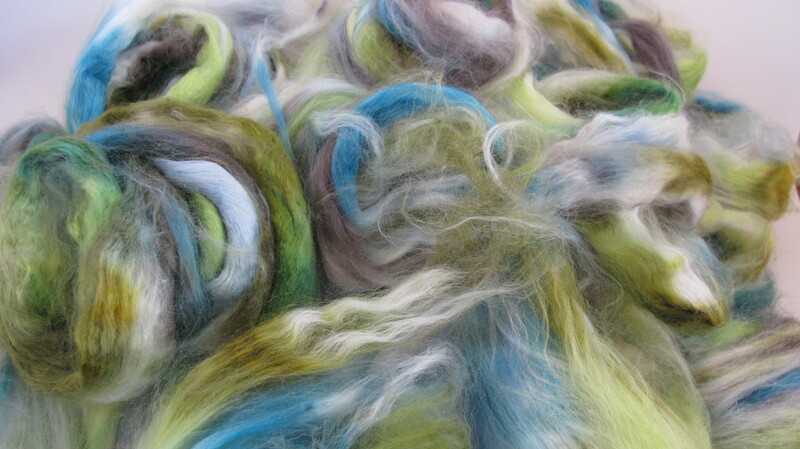 I find it remarkable how there is not even a hint of felting or anything especially having dyed fibre myself and knowing how easy it is to felt it. Taking the fibre from the vinegar water bath to the table for dying is I think where I manage to felt it. Perhaps the use of a colander or something would help. 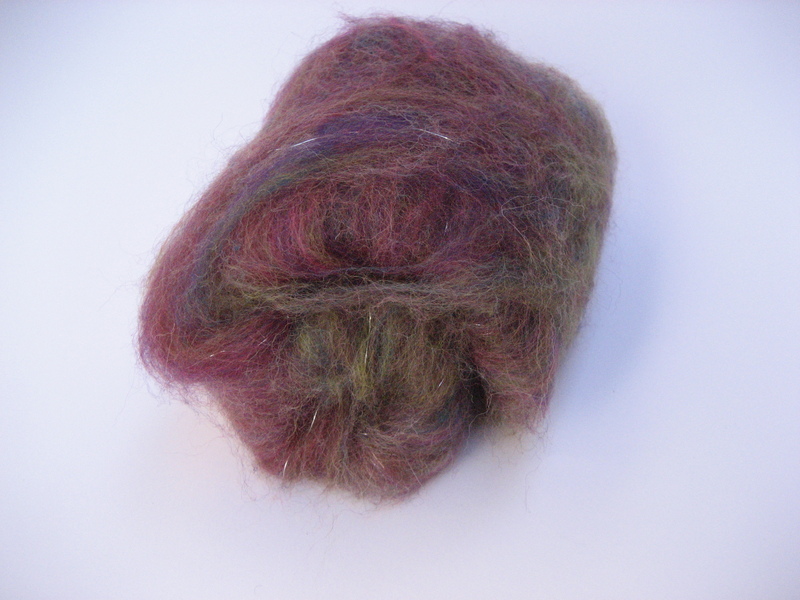 I’d love to hear any tips on dyeing fibre without felting it too much if you have any. My son Elliott was watching the photo shoot and was amazed at the sight of the unravelled tops, he got to pet it too (I made sure his hands were clean first). I like when the boys pet and admire the fibre, it’s important to nurture the wool love in them. 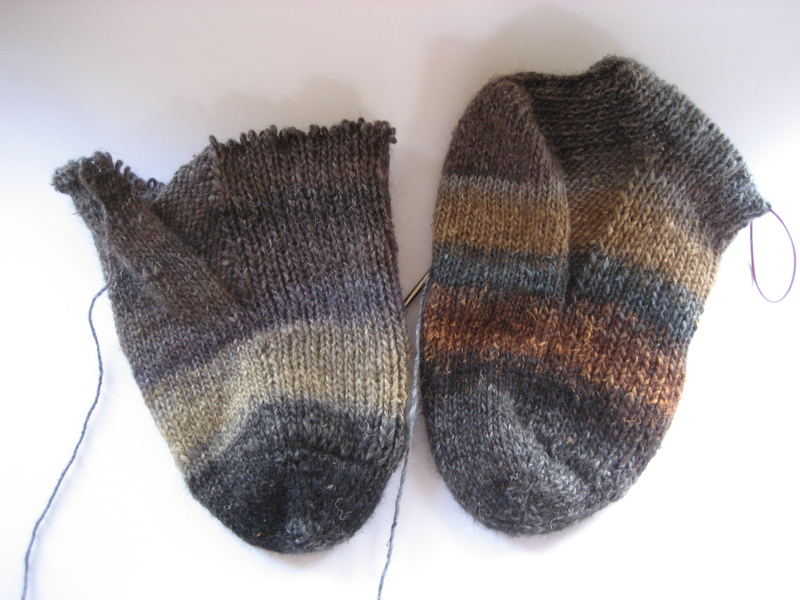 Reluctantly I split the tops lengthways for spinning. 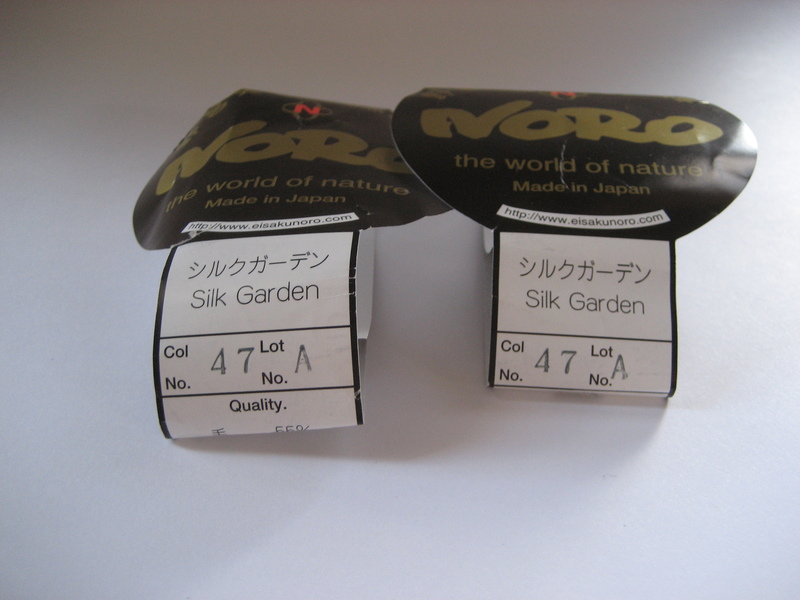 Apparently Noro silk garden whilst it comes in 100 metre balls is dyed with 150 metre colour repeats. *big sigh* well, you live and learn! 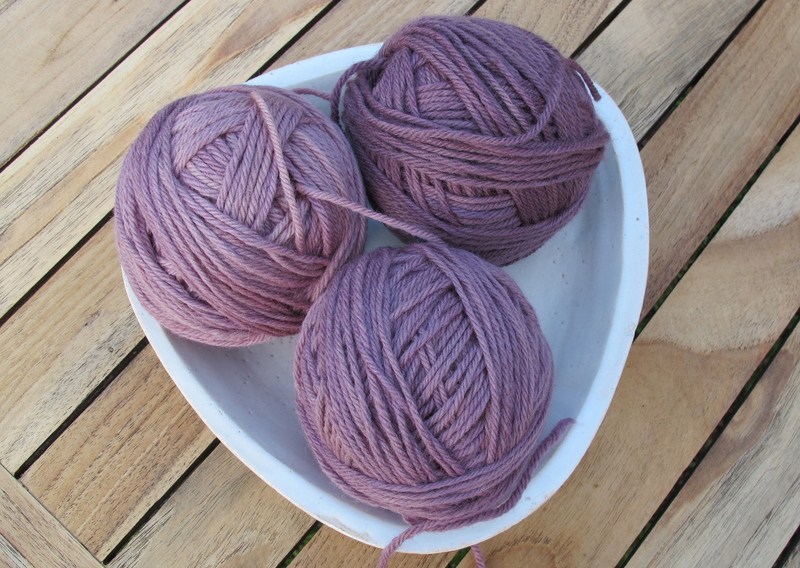 So today I went back to the wool baa and the assistant got every ball of this colour way/dye lot out and I went through them to find one that started with black and grey and contained the rust and blue colours so it doesn’t look like a blind person chose the yarn for the socks. These socks are extra big socks for my poor Dad whose feet and ankles have swollen badly due to his poor health. 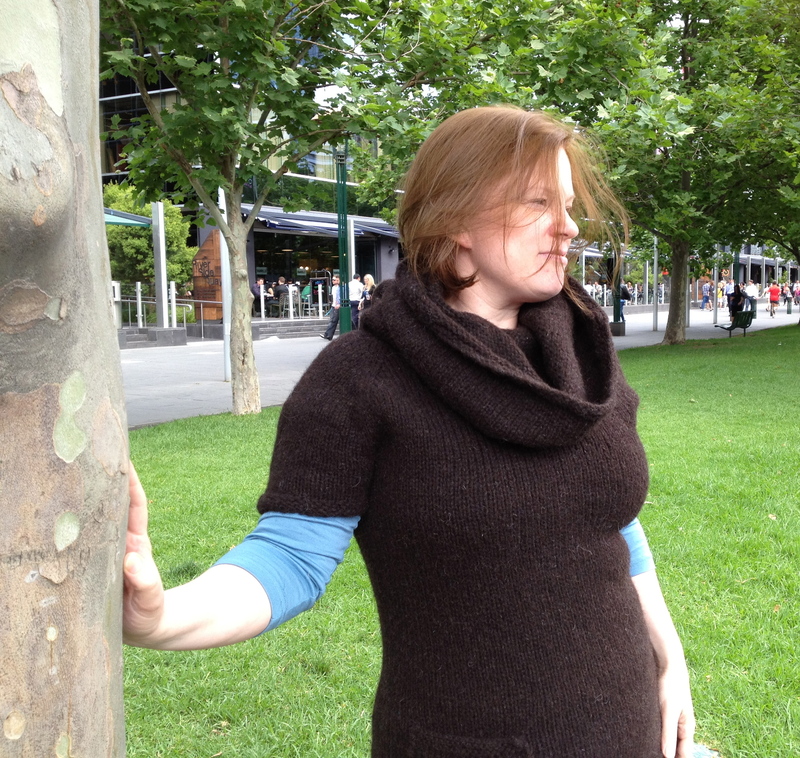 On a more positive note, remember this batt that I made at Bendigo on the Ashford drum carder? 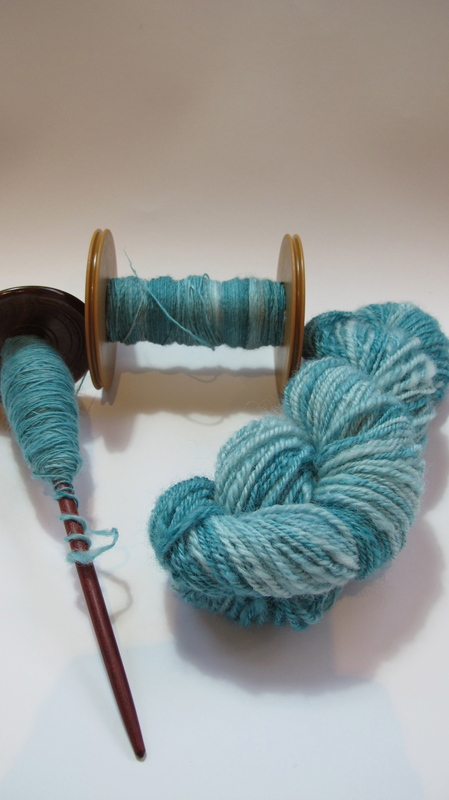 Well last night I got my favourite Ken Ledbetter spindle out and spun it up, then Navajo plied it. It looked very pretty. 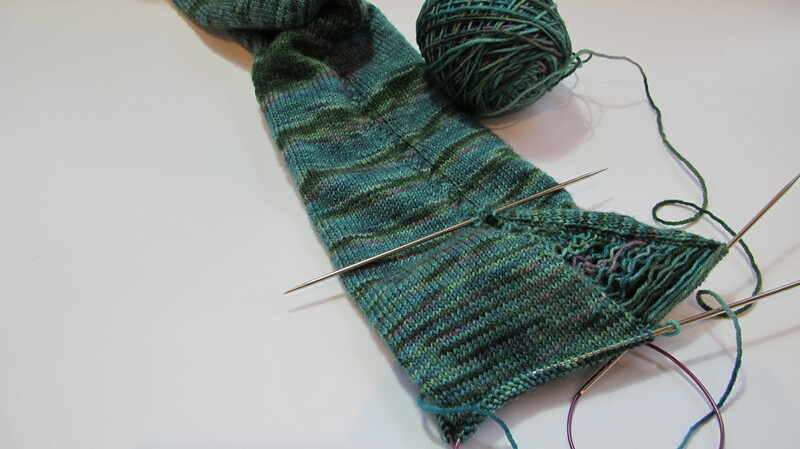 Today I knit it up into a swatch. Mmmm, yummy tweedy goodness. 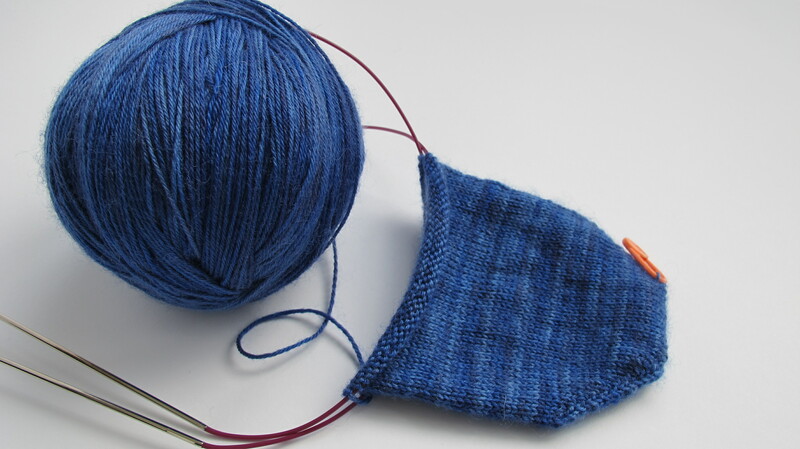 A drum carder is definitely on my wish list so I can make tweedy yarn for tweedy jumpers (life’s too short to hand card for a jumper). 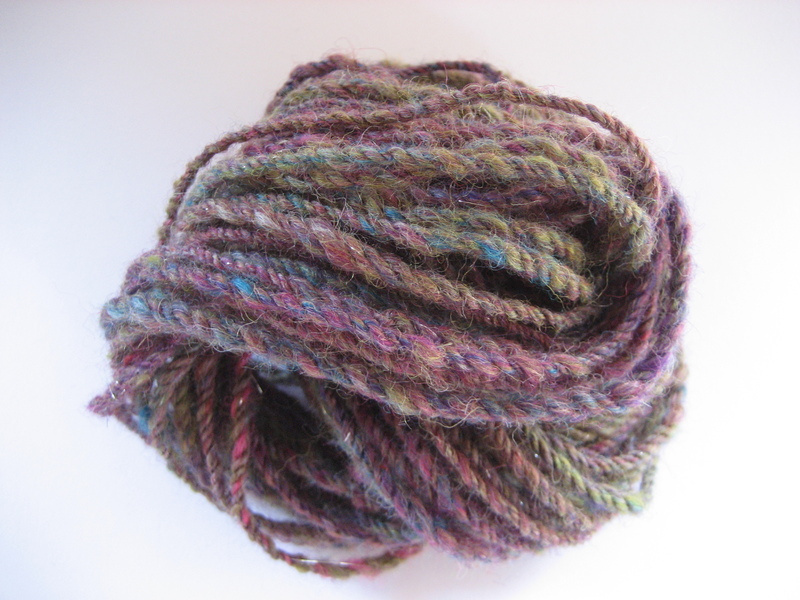 I’m a bit excited by the results of knitting my hand-spun, hand-dyed, navajo plied yarn. 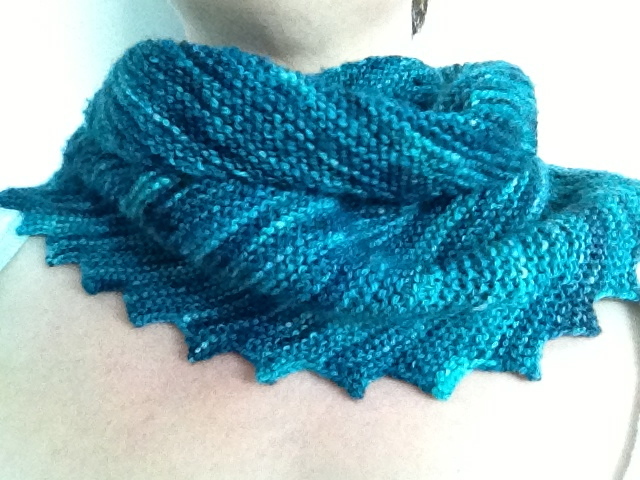 I need to share the sample I knit with you. I think it’s pretty and also when I put it next to the bunny nuggets I can see progress, which is good. I should do this more often. 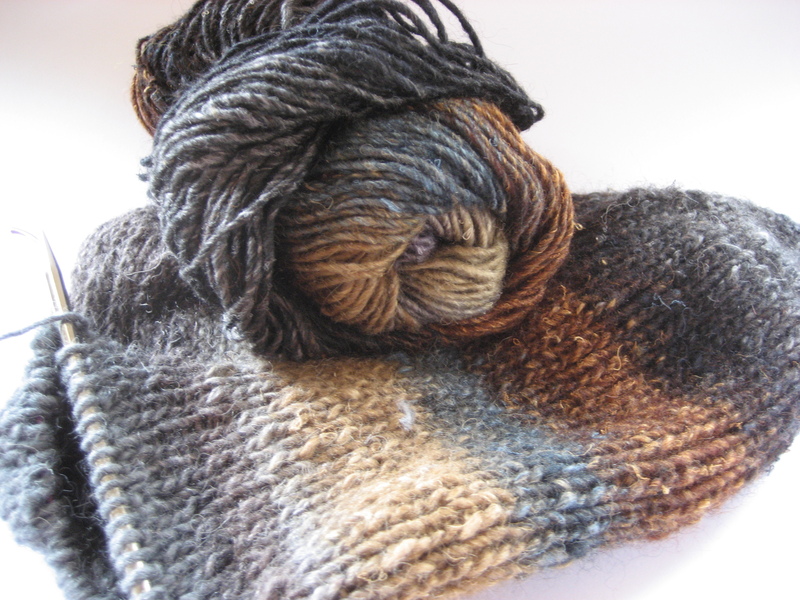 The trouble is I want to knit with hand-spun most of the time but I also want a larger hand-spun to mill-spun ratio in my stash and in order to do this I must knit more mill-spun. 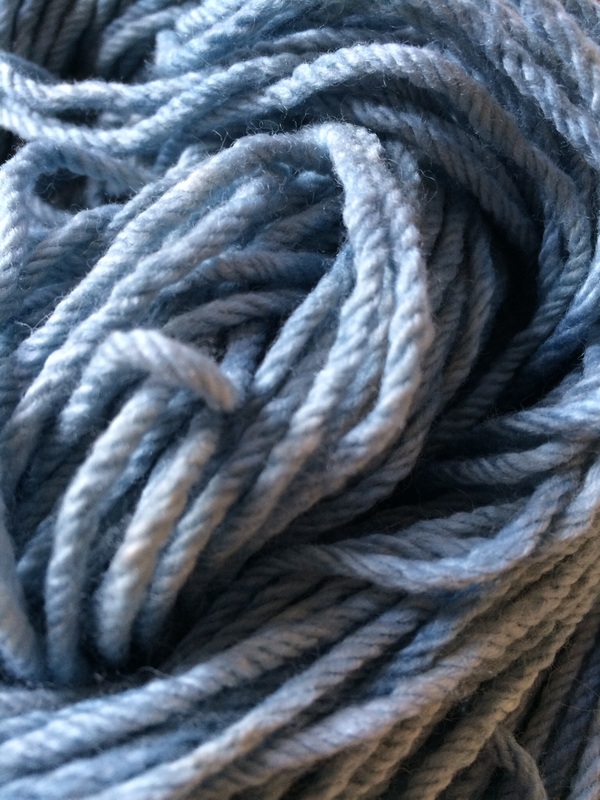 The most exciting thing about this though, is that now I’m reassured that I could spin well enough to make a beautiful hand-spun jumper which is a bit of an ambition of mine. First of all though I need to make this jumper for Sam, should I feel bad that his jumper is going to be kind of a prototype? Today I got him to stand still long enough for me to take measurements except that I forgot to take the top of shoulder to armhole measurement which is probably kind of crucial, doh! 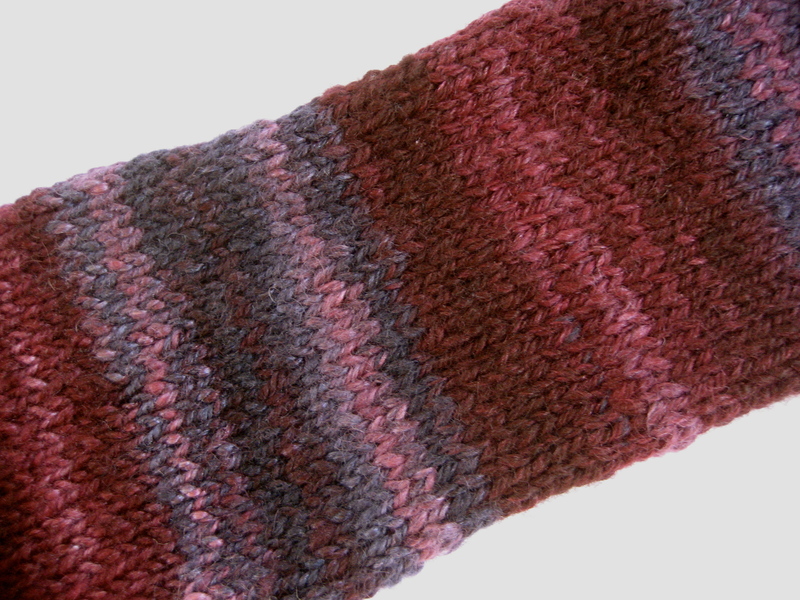 I’m also going to be doing more swatching. I’m having a bit of difficulty finding some zip up, mesh, laundry bags so I can start washing my fleeces ready for spinning, the last 3 times I went to my local supermarket they didn’t have any, I’m going to try Kmart next. 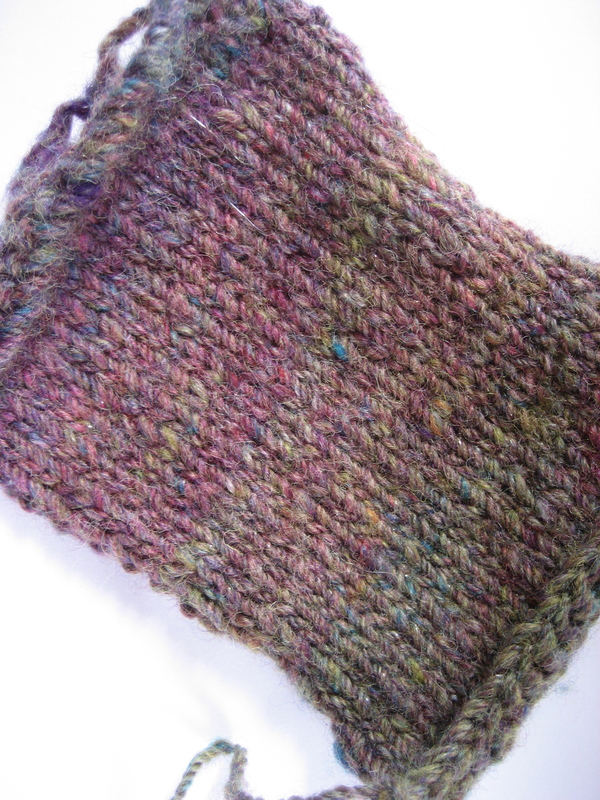 Then I can make my hand-spun, hand-knit jumper, squeee! 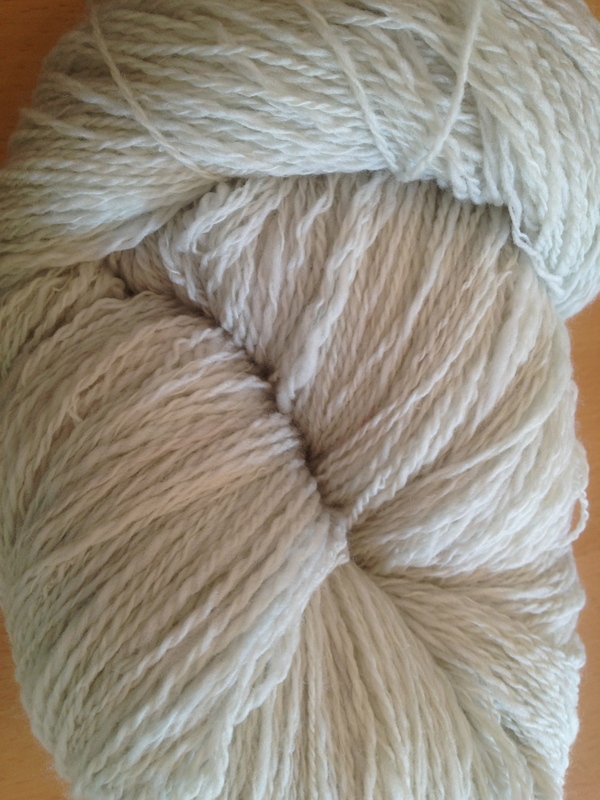 Here are the pics of your birthday yarn being made. 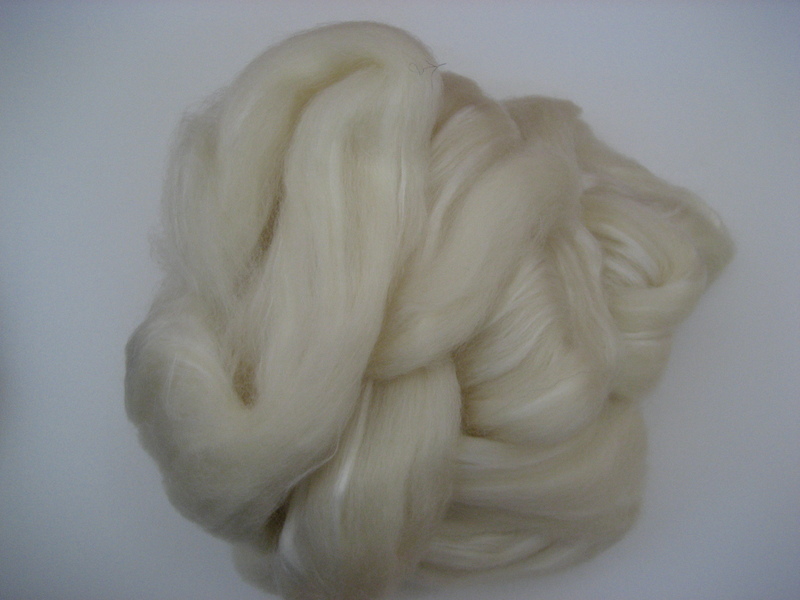 I took some beautiful BFL/Tussah silk tops. I dyed it using colours I know you like. 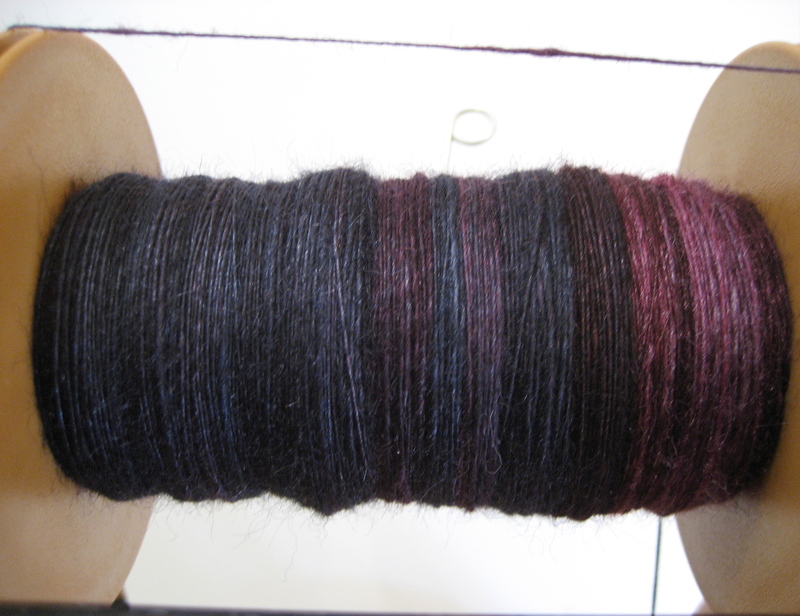 I spun it into 2 bobbins of singles. 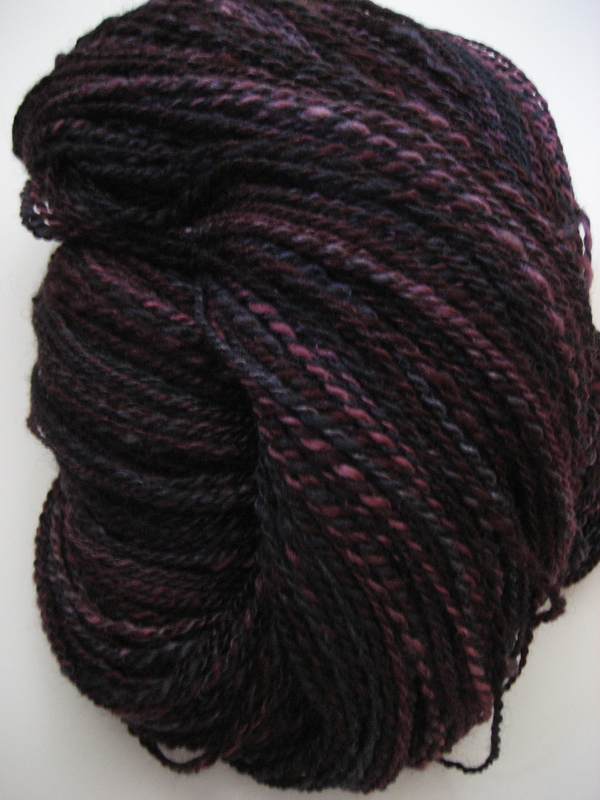 I plied the 2 singles and finished the yarn. 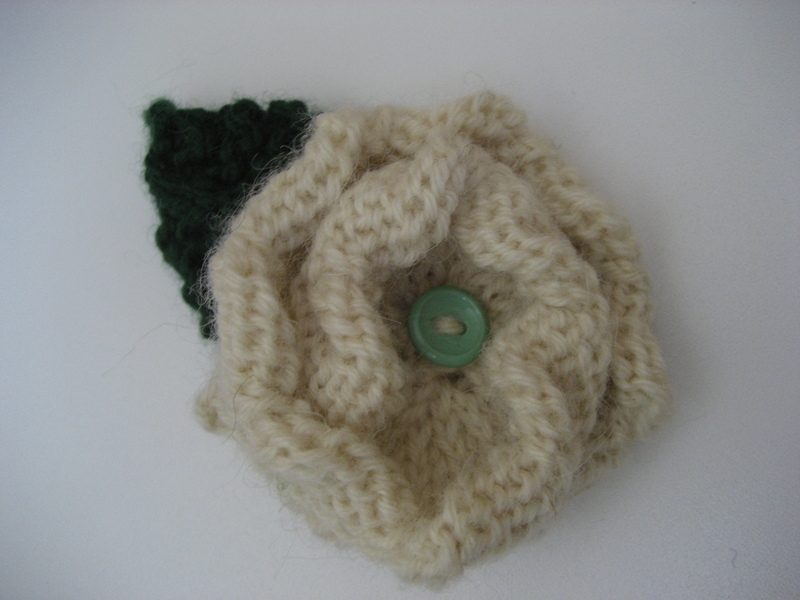 Then I knit my fellow homesick Yorkshire lass a Yorkshire rose, just because.